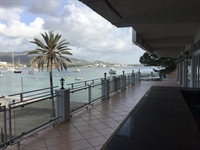 This is a very large bar approx 400 sqm inside with massive Terrace with what has to be one of the best views of Palma Nova Beach. The Bar/Resturant offers a great business opportunity. Since there is no Trespaso to pay since the bar is has been empty for the last year this offers an excellent opportunity for someone to make the own mark on the place. The Bar/Resturant could be suitable for a High-end Resturant of a Modern Cafe Bar offering a wide range of food. It would make a great Breakfast/Lunch location.